No, it’s not the start of an amazingly funny joke (though I’m sure many of you could come up with a pretty good punchline). It’s actually how the inaugural Digital Project Manager Summit began. Photo by Jeffrey Zeldman. View all Digital Project Summit 2013 images here. On October 14th, approximately 150 Project Managers walked through the historic halls of WHYY Studios, Philadelphia’s legendary radio station, to participate in the first event of its kind. It was a two-day conference that was a mix of single track and choose your own adventure presentations with eight speakers presenting to the whole group and four hours of breakout sessions. Prior to the conference, attendees were able to rate their interest in various breakout sessions and were placed accordingly with a maximum of fifty people per breakout session. That process seemed to work out well as breakout sessions were evenly attended and, from conversations I had with attendees, it felt like most people were placed in one of their top 2 choices. Viget sent four Project Managers (Amanda, Josh, Samantha, and myself) to the summit, and I think we all went in with our own expectations and left with our own takeaways. Below, you will find our high-level takeaways and feedback. We usually try to share thoughts within a week after attending events but, in this case, we decided to hold off for about a month to see what sank in and truly made an impression on us. While the talks and sessions resonated differently with each of us who attended, there were a few takeaways I think we all left with: the universal acceptance of the importance of soft skills in a PM; the positive influence of putting ourselves in the client’s shoes; and the need for conflicting personality types on successful projects. It’s great to see that other agencies value soft skills as much as Viget does. Being a Digital PM is NOT all spreadsheets and scheduling. There are nuances. For example, being able to be productive with a variety of people and teams is a must, as many speakers discussed. Nancy Lyons and Meghan Wilker, CEO and COO respectively, of Clockwork Active Media, did a great job of describing this in their “Interactive PM Survival Guide” talk. They focused on the need for a PM to have great emotional intelligence, and what that really looks like in real life. A favorite quote of mine from their talk was “Project Management is like air quality. If you can see it, it’s probably killing you.” That doesn’t necessarily make me feel all warm and fuzzy, but I do think it’s spot on. Rachel Gertz, Project Manager at nGen Works, also emphasized the soft skills needed by PMs. In her talk, “Clients Matter, So Put Your Teams First,” she focused on the idea that you “teach people how to treat you.” A PM needs to know how to build relationships that result in the client trusting the PM and the team. This goes far beyond building schedules and scheduling meetings. It requires knowing when to be firm, when to push back, when to step back, and everything in between. It requires the soft skills that many digital agencies are clearly (and thankfully) emphasizing. The presentation that resonated with me most was from Sam Barnes, Development Team Manager at Global Personals. He gave a talk entitled “Vice Versa Client Management,” which detailed his experiences of being a client after years of being a PM. He learned a lot of things by being on the other side, and I felt he offered very practical lessons that we can all learn from. We should never assume that clients understand our language, process, or deliverables without detailed explanations. We also should never forget that, in most cases, the project we are working on is not anywhere close to their only responsibility. They are busy, at some point we “will likely force a client to ruffle feathers (sometimes important feathers) internally,” and they are getting opinions from everywhere. Being a client is hard, and that should be in the front of our minds as we move through a project. The last speaker of the conference was Michael Lopp, Director of Engineering at Palantir. Everything he spoke about in his talk “Stables & Volatiles,” including his experiences with Apple Inc. running store.apple.com, focused on the presence and need for two personality types—volatiles and stables. Volatiles are disrupters that get things done, but might not get them done in the way that’s expected of them. Stables love following the rules and expectations, and are not as interested in shaking things up. Though he spoke mostly about companies as a whole, I think his message can be translated to project teams as well; in order for a team to be successful, it needs the presence of these two personalities. They might conflict sometimes, but they both have their strengths and weaknesses and it’s their ability to balance each other out than can drive success. It’s important for PMs to understand and recognize these personality types within the team, and make sure everyone is in a position to do their best work. 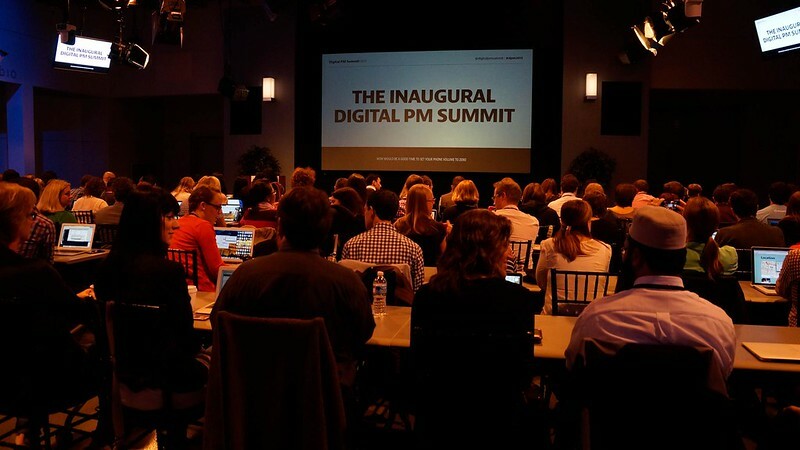 As mentioned at the start of this recap, DPM2013 was the first ever Digital Project Management Summit. The team at Happy Cog that put on the Summit clearly drew on what they’ve learned when putting together other conferences, and created a conference that was relevant, valuable, and one that operated smoothly. If there is one thing I’d like to see changed for DPM2014, it’s how in-depth the talks and sessions go into their topics. Many speakers seemed to make broad statements, support them with a few high-level points, and then moved on to the next statement. These broad statements were spot on and relevant but, ultimately, they were too high-level to be actionable. I loved how much of the advice from the presenters hit on some core truths about project management (“be patient, “tackle the hard conversations immediately”), but, at the same time, those were things I got the feeling most people in the room already knew and believed in. Next time, I would love it if some of the presenters provided a shorter list of points that were REALLY dug into. When talking to a room that really gets it, specifics will often be more tangible and impactful than quick, high-level points. I noticed the same tendency towards generalizations in many of the breakout sessions as well. The topics of the breakout sessions were extremely relevant, but many of them ended up being relatively unstructured discussions among attendees, which led to mostly high-level talks. One takeaway for me, then, was that these types of discussion-based sessions might be better-suited as panels, or better prepped by having attendees fill out a questionnaire ahead of time so the sessions could have been more focused. Of course, hindsight is 20-20. With this being the first ever DPM Summit, it would have been impossible to know how in-depth to go with talks and sessions, since it would be impossible to know what experience each attendee was coming to the table with. I would agree that, for a first-time conference, it’s probably wisest to err on the side of high-level discussion. Getting too much into the weeds could risk losing a lot of people. All in all, attending DPM2013 was very valuable, and I plan to attend DPM2014. Beyond the high quality and relevance of the talks, it was simply fantastic getting to know and hang out with other digital project managers. The spirit of connecting and building a community was strong, and something I want to help continue in 2014. Did you attend DPM2013? What were your thoughts and takeaways?